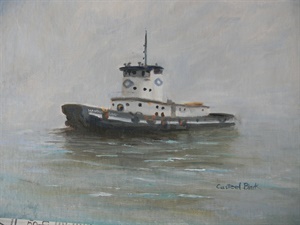 Norma Casteel Black is a versatile artist who creates works in oil, pastel and watercolor. Her work is figurative. Norma has been painting and drawing since she was a child. Norma holds a degree in painting and print making from Indiana University Herron School of Art. She worked for 25 years as a commercial artist in Indiana and Chicago. Most of her commercial work was for the publishing business. She also created watercolor illustrations for educational filmstrips. "When I was a kid I discovered I had a knack for capturing a likeness. I was stage struck and liked to draw portraits of movie stars from their photos in movie magazines. Soon I was drawing family and friends from life. That's how I got into painting portraits. I participated in local art shows and started getting commissions." 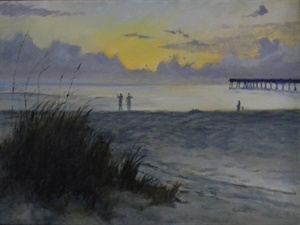 Norma still paints portraits, but since moving to Florida, she has begun plein air painting. 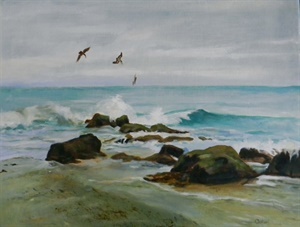 "I have developed a passion for painting seascapes. 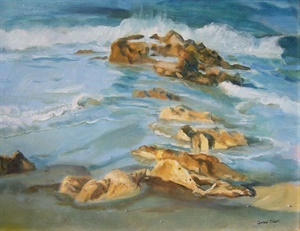 It's a great challenge to try to capture the movement of the waves and the subtle changes in color and light." Content copyright by Norma J. Casteel Black.